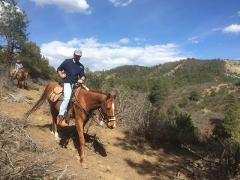 If you’re looking for a two hour ride, join us on our Ranch ride which travels through the Gambel Oak and Ponderosa Pine foothills and climaxes with a spectacular view from the saddle of Rincon Ridge at 8000 feet. From there you’ll appreciate a gorgeous view of Durango and the La Plata Mountains. The ride returns to the ranch on the trail through the riparian area of the Florida River and includes two river crossings (water levels permissible). If you’re looking for a one hour ride, join us on our Ranch ride which travels through the Gambel Oak and Ponderosa Pine foothills with incredible views of the Palmer Quarter Horse Ranch that reach all the way to New Mexico! The ride finishes with a crossing of the Florida River (if the water levels are low enough) and a ride through the riparian area along the Florida River. All Day ride in the Weminuche Wilderness near Durango. 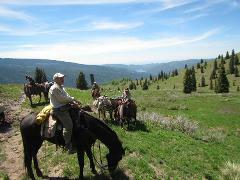 For indulgence in wilderness, try a full day ride in the San Juan National Forest. You’ll wander through Aspen and Douglas Fir, enjoy abundant wildflowers, and savor views of the Florida Basin and the Needle Mountains. On a clear day, views extend all the way into New Mexico to the South and Chicago Basin to the North. Price varies depending on the number of people in the group. 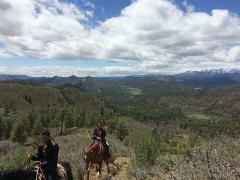 If you’re looking for a little bit longer ride, join us on our three hour Ranch ride which travels through the Gambel Oak and Ponderosa Pine foothills and climaxes with a 360 degree view at 8135 feet. From there you’ll appreciate a gorgeous view of Durango and the La Plata Mountains. The ride returns to the ranch on the trail through the riparian area of the Florida River and includes two river crossings (water levels permissible).